Have you jumped on board with app.net? 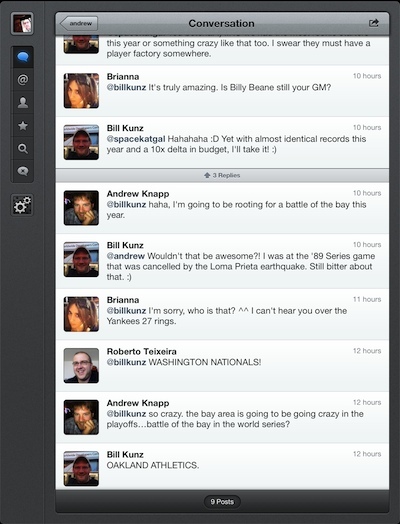 It is just like Twitter without being just like Twitter. The major difference everyone talks about is that you have to pay for access but in exchange you don’t have all the in-line ads and promoted hashtags. Initially launched on crowd funding, the service recently lowered it’s price due to exceeding their expectations for quantity of sign ups and paid subscriptions. Can’t forget, app.net is 256 characters instead of 140 so you can say more! 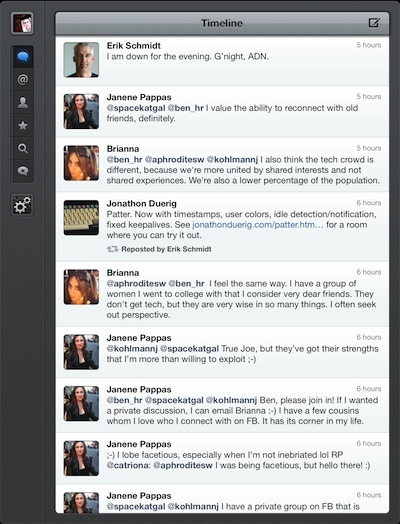 Now, jump back a little bit, where we were talking about Twitter updating their iPad app. We got a bunch of love/hate emails about the new look so we covered Tweetbot as an alternative. 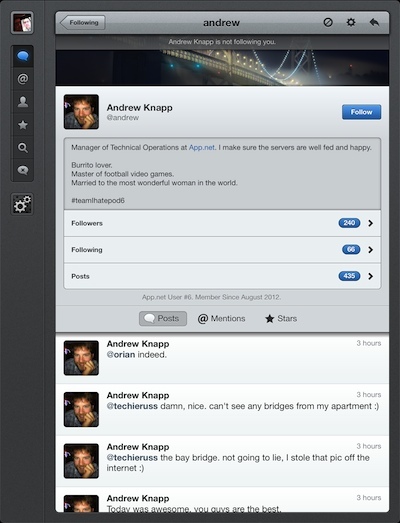 The folks that wrote Tweetbot, Tapbots, have now introduced an iPad and a iPhone app for app.net users. There has actually been iPhone and Android solutions before this, but Netbot (too many ‘bots’ to follow?) is the first full iPad only option other than the Safari browser or running in 2x. 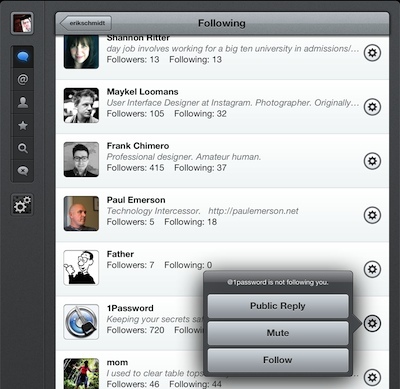 Netbot launches to your overview Timeline, which should look familiar to the current users of Tweetbot. Down the left is buttons for quick access to other people mentioning you, your Profile, Star’d posts, Search and Mute Filters. The Mute Filters is very handy if there is a subject trending that your just not interested in. Oh yes, and the ‘Post new’ button in the upper right corner. 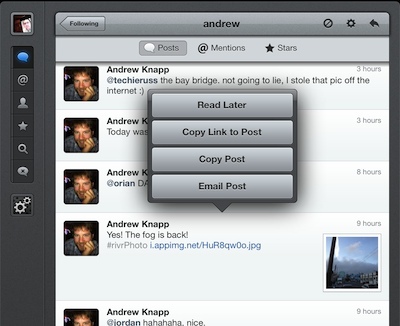 You can choose to post to Twitter at the same time as you add a post to your app.net account. Tap a face to expand to their Profile. Notice that the Profile Background art used in app.net appears as a graphic above the person, rather than behind, framing the image, used in Twitter. Netbot provides quick access to all of the important info you may want to know about the person and their friends/posts. Slide a post to the right to view the conversation that post is part of. A feature that really helps when you want to be part of what is currently being discussed rather than having to hunt for the many parts in one line Timeline. We should mention, Netbot doesn’t seem to all for the creation of unique Timelines so everyone you follow is in one long refreshable Timeline. We don’t know if that is a limitation of app.net or a feature just not supported yet in this initial version of Netbot. Using the app, you will find that the developers wrote it so that there is many features, but there are few buttons. This means a tap on a post is different from a double tap. You choose what a triple tap will do in the Settings area. Netbot extends the tapping with the swipe of a post, to the right to expand for the conversation, to the left expand the single post. Tapping an image expands it as a pop up rather than expanding inline or moving to another screen. Selecting a link in a post, opens the page in a in-app browser. It is amazing how with the right user interface, Netbot has brought app.net into our everyday life where we have actually started using the service more!